This article originally appeared on The Daily Free Press. Beginning Friday night, the No. 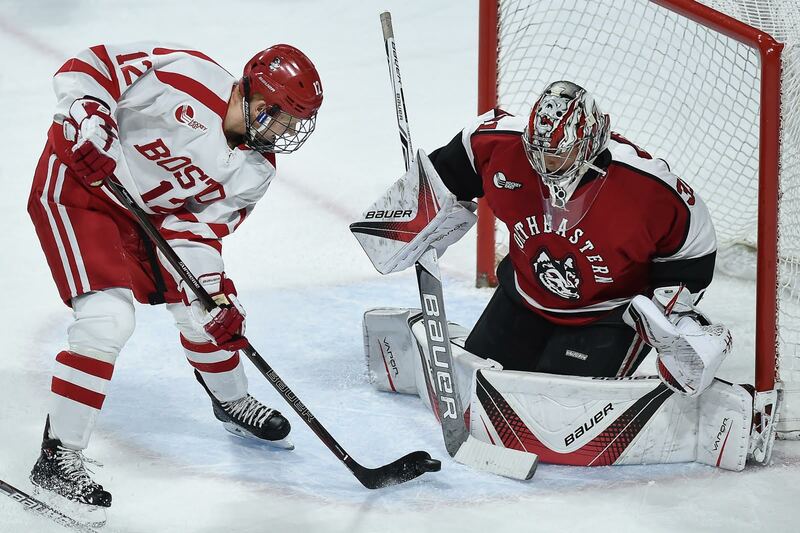 8 Boston University men’s hockey team will host Northeastern University at Agganis Arena for a best-of-three series in the quarterfinal round of the Hockey East Tournament. The second-seeded Terriers and eighth-ranked Huskies will square off again on Saturday evening and, if necessary, on Sunday night. Both squads are riding high, as BU is fresh off earning a share of the Hockey East regular-season title, while Northeastern is 11-3 in its past 14 games. Perhaps more importantly, though, senior captain and defenseman Doyle Somerby said that postseason play brings about urgency. These two sides met back in early November, with the Terriers taking three of a possible four points from the weekend series. However, BU (21-10-3, 13-6-3 Hockey East) head coach David Quinn said those results won’t influence these upcoming games. The dominant reasons, Quinn said, are head coach Jim Madigan’s team is healthy and “better defensively.” As for Somerby, he said Northeastern (18-13-5, 9-10-3 Hockey East), which won the 2016 Hockey East Tournament, always seems to get hot come playoff hockey. The superlatives from Somerby bear fruit, too. Northeastern’s power-play unit scores 28.95 percent of the time, good for second in Division I hockey. Meanwhile, it boasts three of the nation’s top-10 scorers in senior Zach Aston-Reese (62 points), junior Dylan Sikura (56 points) and sophomore Adam Gaudette (52 points). The Huskies’ biggest flaw, arguably, is goaltender Ryan Ruck, whose goals against average (2.94) and save percentage (.896) all rank in the bottom three of Hockey East netminders. Through those highs and lows, Quinn said Northeastern poses a serious challenge. Leading that charge for BU – the youngest team in college hockey – will be a slew of talented youngsters. Freshman goaltender Jake Oettinger, who will start on Friday, ranks in the top-10 nationally in goals against average (2.06), save percentage (.927) and shutouts (four). Meanwhile, forwards Clayton Keller (38 points) and Patrick Harper (34 points) both rank in the top-five nationally in freshman scoring. Outside of any single player, Somerby said another motivator is how BU fared in the 2015-16 postseason. 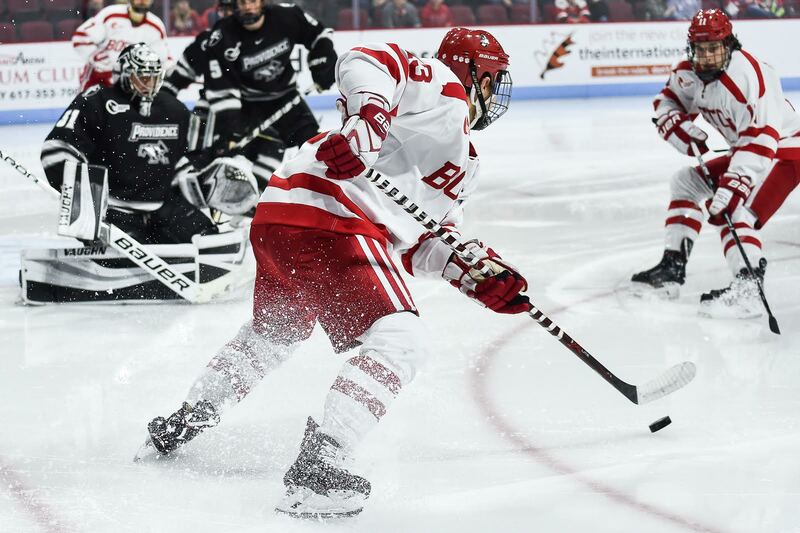 In the Hockey East Tournament, the Terriers narrowly squeezed by the University of Massachusetts Amherst in the opening round, only to be promptly bounced by the University of Massachusetts Lowell. Come the NCAA Tournament, BU lost in the opening round, 7-2, to the University of Denver. In simple terms, Somerby said playoff hockey means there’s no guarantee of another game. All things considered, Quinn said BU must approach the weekend one tilt at a time. From that, he said, BU could secure its ninth Hockey East Tournament title. So, what will Quinn be looking for? Playoff hockey is officially here, BU hockey fans! We’re live at Agganis Arena for Friday night’s clash between the Terriers and Northeastern, which will get underway at 7:05 p.m. This is the first clash of a best-of-three series, with other contests occurring on Saturday and Sunday. We’ll be providing minute-by-minute updates, so follow along on our live blog below! 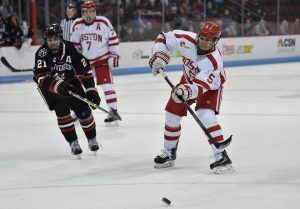 Now that the dust has settled, let’s reflect back on the Boston University men’s hockey team’s weekend series against Northeastern University. On Friday night at Matthews Arena, the Terriers let up a late equalizer and struggled to tune out the Matthews Arena crowd. Simply, the 4-4 tie in overtime left BU with a bitter taste in its mouth. 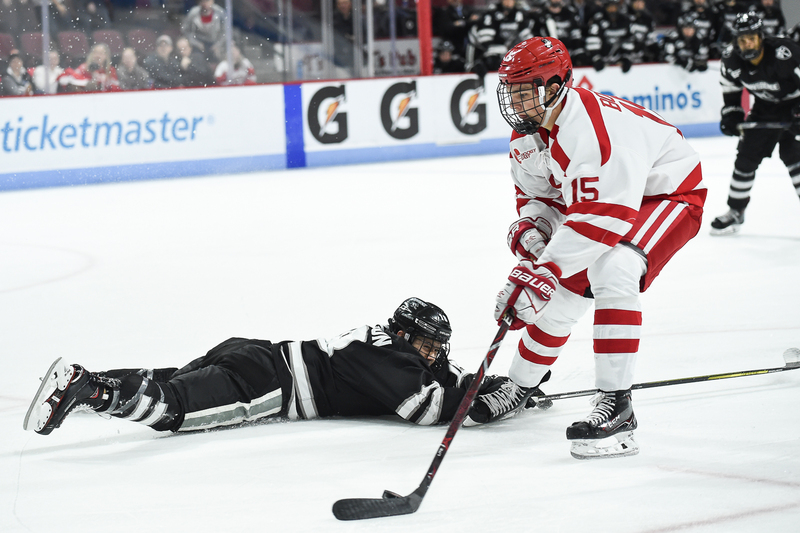 In the return affair on Saturday evening at Agganis Arena, the Terriers bounced back in a major way, earning a 3-0 win. Freshmen Patrick Harper, Jake Oettinger and Kieffer Bellows led the way, while BU finally stayed out of the box for an extended period of time. 1.) Second line – It’s interesting to note that the second line had much more success than the first line this weekend. That second line of Patrick Harper, Clayton Keller and Jordan Greenway scored five of BU’s seven total goals in its two games against Northeastern, while the first line of Kieffer Bellows, Jakob Forsbacka Karlsson and Bobo Carpenter totaled just one. In Saturday’s game, both of Harper’s goals featured assists from Keller and Greenway, indicating that those three have really gelled together quickly. 2.) Jordan Greenway – After Greenway picked up a 10-minute misconduct penalty that proved crucial in the tie with Northeastern on Friday, Coach David Quinn responded by sitting Greenway for the entire first period Saturday. In his press conference on Friday, Quinn made it clear he wasn’t going to let those type of penalties slide, and he backed it up by sitting Greenway. 5.) Tommy Kelley – When BU hockey fans picture Tommy Kelley, odds are they envision a fourth line player who is on the periphery. Now a senior, it’s clear that coach Quinn wants “TK” to take on a far more expansive role for the Terriers. Follow along on our live blog of tonight’s action between BU and Northeastern. 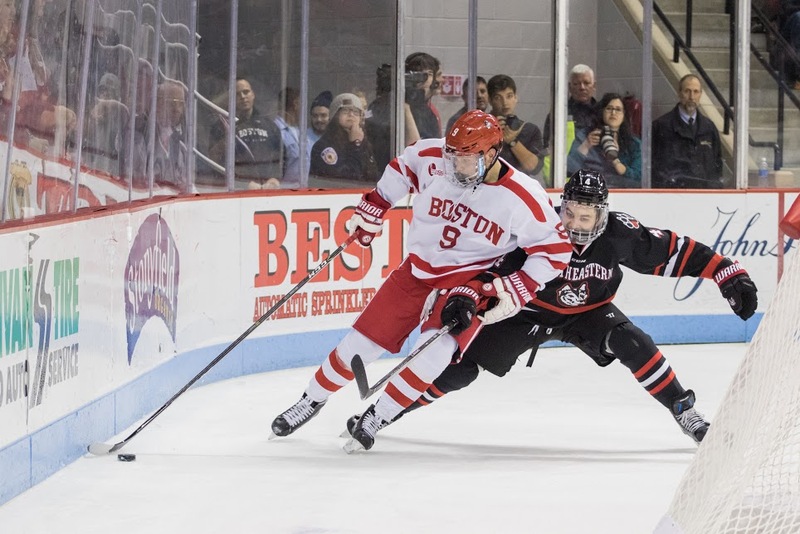 Puck drop is set for 7:05 p.m.
Friday night’s clash between the Boston University men’s hockey team and Northeastern University surely didn’t disappoint. There were four lead changes throughout, including a game-tying goal with under a minute left by the Huskies’ Zach Aston-Reese. The final scoreline was 4-4, as an overtime period couldn’t produce a winner inside a raucous Matthews Arena. For greater details on what unfolded, check out Nick’s recap and Jonathan’s sider. BU kicked off Hockey East play on Friday night, drawing, 4-4, at Northeastern’s Matthews Arena. Here’s what head coach David Quinn had to say in the result’s aftermath.